Creating a garden can be fun and helpful. First you will need to figure out what you want to grow – fruits, vegetables or flowers. Once you have this figured out, then determine the size of garden space. To make sure your garden produces a good crop, you need to work the soil to make it good for planting. You will make rows and dig holes to plant the seeds. Plant the seeds, then cover them with soil. You may need to fertilize the seeds after planting them. You might think you are done when the planting is finished, but this is really just the beginning. Everyday you have to check on the garden to see if it needs water. If it does, then water it. When the seeds start growing into vegetables or fruits, you must pick them when they are ready. Take all the ripe vegetables or fruits and clean them. Then you can enjoy eating what you have grown in your garden. Q. What brought you back to Gibb Street? A. I grew up here, then moved away. I came back to take care of my parents. Q. Has Gibb Street changed over the years? A. Yes. It used to have wagons pulled by horses. Now there are cars. The people have changed also. All the factories are closed and buildings are abondoned. Q. What do you do in your apartment all day? A. I look out the window a lot. There is not much to do. I watch all the people that live here. Q. What did you think of the girl when you saw her in the vacant lot? A. I thought she was up to nothing good. I thought she was burying drugs or something bad. It could have been money or a gun. Q. Why didn’t you call the police? A. I wanted to solve the mystery myself. I watched for her but the rain kept her away. Then she showed up again and it made me go down to the lot. Q. What made you go down to the vacant lot? A. I wanted to dig up where the girl was burying something to see what it was. I worked in a parole office and I know when someone was not doing something they should. I knew she might dig it up and take it away if I didn't go look. A. I found a couple of beans with roots. I did not think this was the right thing at first. I realized I wrong to dig up her beans. Q. How did you feel when you found the beans? A. I felt bad that I might have hurt them. I felt bad that I dug up her beans that she was taking care of. I wanted them to be ok.
A. I gently covered the beans with soil. I bought a pair of binoculars to keep an eye on the garden. Seedfolks by Paul Fleischman is a great story about people coming together from different backgrounds. 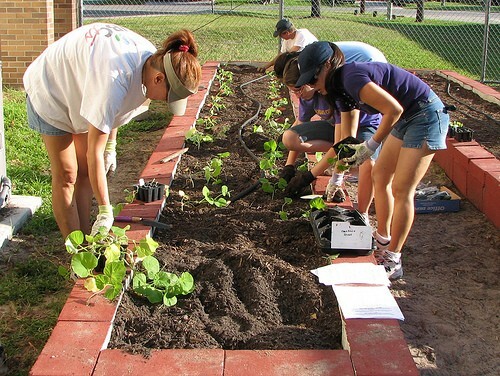 They planted a community garden which let them get to know others. The characters stories were entertaining and informative about their personal background. The characters were from all over the world with different experiences. They all came together and created a community garden each growing different things. The author wrote this book to inform and entertain while learning about community gardens. I would give this book a 4 Star rating.